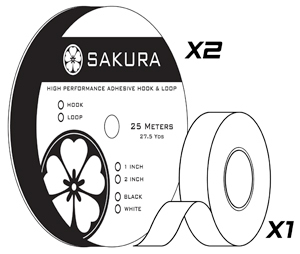 Our SAKURA Starter Kit includes 1 roll of 1″ Hook, 1 roll of 1″ Loop, and 1 roll of Banner Tape. SAKURA high performance double sided banner tape is engineered to bond vinyl substrates like no other. It is ideal for hemming or joining banners rather than sewing or welding. No more sending your banners out for finishing – do it all in house with SAKURA. SAKURA high performance double sided banner tape is engineered to bond vinyl substrates like no other. It is ideal for hemming or joining banners rather than sewing or welding. No more sending your banners out for finishing – do it all in house with SAKURA.